This month’s Craft Challenge was our annual DIY Halloween Costume Challenge! The challenge was to create a handmade costume that was spectacular. There were so many participants with amazing costumes. The costume could be for yourself or someone else. Our winning entry was created by Summer6061! Her entry titled, “Little Aviator” is brilliant. 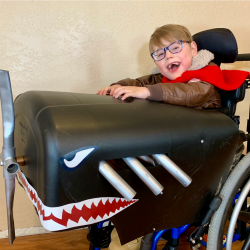 She created an airplane around her five year old’s wheelchair and turned him into a number one flying ace. Check out the winning entry here. For winning, Summer6061 has won an item from one of Craftster’s online shops! Hope everyone had fun creating for the challenge this month! Happy crafting!